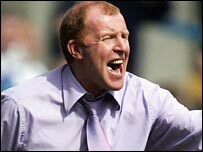 Gary Megson has left his post as manager of League One side Nottingham Forest by mutual consent. The former West Brom manager replaced Joe Kinnear at the City Ground in January 2005. He was unable to stop the former European champions from slipping into the third tier of English football for the first time in 54 years. 'Megson Out' banners were displayed by supporters as Forest fell to a 3-0 defeat at Oldham on Wednesday. Hostility against him from supporters had escalated after a run of only one win in the last 10 matches. The Reds find themselves only four points above the League One drop zone. The club's directors are set to meet to discuss an interim managerial appointment and no further comment will be made until chairman Nigel Doughty has spoken to the players and staff on Friday morning. Megson becomes the eighth manager to have left the City Ground since Brian Clough retired in 1993. And Forest legend Garry Birtles, who won two European Cup winners' medals under Clough, said the players have to take some of the blame for their recent slump. He said: "We've all heard rumours about Gary losing the dressing room. "But we also heard stories about players' ill discipline and lack of fitness when Gary arrived. "The players certainly have to take their share of the responsibility for the situation the club finds itself in." Birtles would like to see former boss Paul Hart back in charge. Hart led the Reds to the Championship play-offs in 2003 after bringing the likes of Jermaine Jenas, Andy Reid and Michael Dawson through the Forest academy. He was sacked in 2004 and replaced by Kinnear. Birtles said: "We've seen Leicester and Derby recently lose their managers and make interim appointments. "That could be the way forward for Forest and I think they could do a lot worse than get Paul Hart back in until the end of the season. "Harty knows the academy and he knows the club."